If any of you ever watched the cartoon of Pokemon in the 90’s like I did with my kids, you heard that question yelled out every day! Then after the commercial break, they would show us which Pokemon came out of the big red, white and black ball. So if you don’t know who this one is, meet Turtwig! Isn’t it adorable? I want one! I have been wanting to paint several more Pokemon characters for the last year or so and just hadn’t gotten around to it. I was going to outline this one with pen, but decided not to. I had a lot of fun painting it, and if you know anything about me at all, you would know why! I love turtles and sea turtles! So Turtwig was fun to paint! I have a How to Draw Pokemon book that I bought years ago. It has several in it, so that is where I got this. I eyeballed it and put the shadows in that they have in the book, so it isn’t my original design. The little How to Draw book was published by Scholastic. I originally bought it for my son since he was so into the show, the movies, and collecting the Pokemon cards. We even have a Pokemon game! However, drawing never became a hobby of his. In the past I pained two other Pokemon characters, Mudkip for my son, and Pickachu for my daughter. 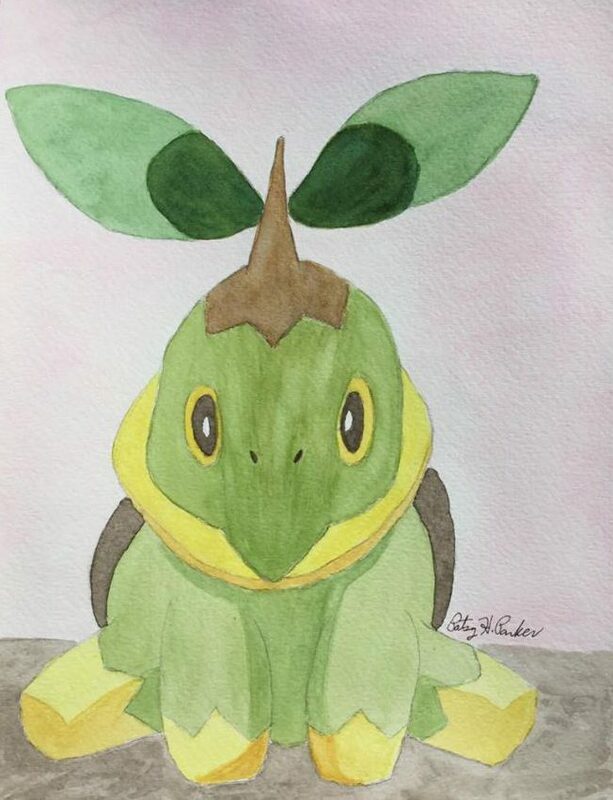 I painted both of those in acrylics, though, so this is my first watercolor Pokemon. I have not had a desire to go hunting for any, but my daughter has caught several. I am not sure if she is still doing it. We live almost an hour’s drive away from the biggest town near us so there are not many Pokemon lurking out here in the boonies! But who knows how many more will come out of my paint brushes? I hope everyone is enjoying the change in weather (if you are having any.) We have finally gotten some really nice cool weather for our area in the last week or so. We have been able to leave the windows open for most of the day and night. It just gets too stuffy in the later afternoon, so I still turn on the A/C then. But right now it is only 50 degrees and it is after 7:00 a.m.! When the weather is the hot temperatures we usually get in summer, it is at least 80 degrees by this time in the morning. I am making coffee right now and sitting here dressed in a flannel shirt over a t-shirt, sweat pants, and socks on my feet (which I haven’t felt in many months.) I am really hoping that Fall is officially here! So wherever you are, if you are experiencing this nice cooler weather after a long hot summer, grab a cup of hot coffee or tea, and enjoy the cool air! Maybe you can even go in search for some Pokemon! Posted on September 6, 2016, in Art Talk, Watercolor Paintings and tagged drawing, painting, watercolor painting. Bookmark the permalink. 2 Comments.